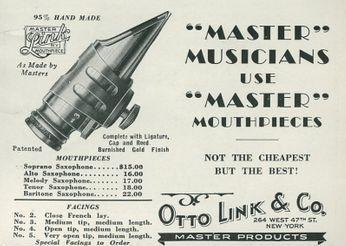 Otto Link special model mouthpieces. Below and to the left: the rare Coleman Hawkins Master Link alto model. Vido William Musso (7 January 1913 - 9 January 1982). A thick-toned tenor-saxophonist whose spirited and enthusiastic solos helped compensate for his weak music reading skills, Vido Musso was popular for a period in the 1940's. His family moved to the United States in 1920, settling in Detroit. Musso first played clarinet before switching to tenor. He moved to Los Angeles in 1930, began an association with Stan Kenton and the two were sidemen in several of the same local bands. Musso and Kenton briefly had a big band in 1936 but then the tenor-saxophonist was discovered and became a bit of a name playing with Benny Goodman's Orchestra (1936-37). After a period with Gene Krupa's new band (1938), Musso rejoined Goodman a couple times (1939 and 1941-42). 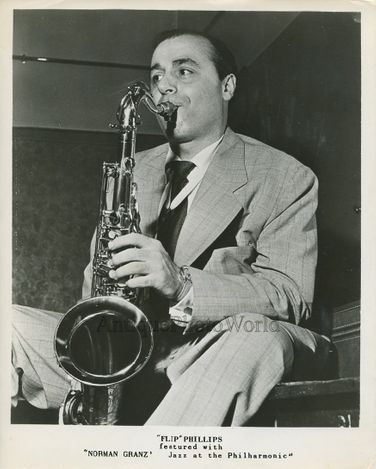 He also had stints withHarry James (1940-41), Woody Herman (1942-43) and Tommy Dorsey (1945) between attempts to lead his own big band (none of which succeeded).Vido Musso was at the peak of his fame during his two periods with Stan Kenton (1945-46 and 1947), particularly for his emotional rendition of "Come Back To Sorrento." He eventually moved back to Los Angeles, played locally and, starting in 1957, worked regularly in Las Vegas. All of Vido Musso's recording dates as a leader are somewhat obscure. There was a four-song Savoy session in 1946, eight boppish titles in 1947 for Trilon and other dates for Arco, Fantasy (three songs in 1952) and RPM plus two albums for Crown and Modern (1954-55). ~ Scott Yanow, All Music Guide. Otto Link New York . A thick-toned tenor-saxophonist whose spirited and enthusiastic solos helped compensate for his weak music reading skills, Vido Musso was popular for a period in the 1940's. His family moved to the United States in 1920, settling in Detroit. Musso first played clarinet before switching to tenor. He moved to Los Angeles in 1930, began an association with Stan Kenton and the two were sidemen in several of the same local bands. Musso and Kenton briefly had a big band in 1936 but then the tenor-saxophonist was discovered and became a bit of a name playing with Benny Goodman's Orchestra (1936-37). After a period with Gene Krupa's new band (1938), Musso rejoined Goodman a couple times (1939 and 1941-42). He also had stints with Harry James (1940-41), Woody Herman (1942-43) and Tommy Dorsey (1945) between attempts to lead his own big band (none of which succeeded).Vido Musso was at the peak of his fame during his two periods with Stan Kenton (1945-46 and 1947), particularly for his emotional rendition of "Come Back To Sorrento." He eventually moved back to Los Angeles, played locally and, starting in 1957, worked regularly in Las Vegas. All of Vido Musso's recording dates as a leader are somewhat obscure. There was a four-song Savoy session in 1946, eight boppish titles in 1947 for Trilon and other dates for Arco, Fantasy (three songs in 1952) and RPM plus two albums for Crown and Modern (1954-55). ~ Scott Yanow, All Music Guide. The Otto LinkFour star Vido Musso facing was listed as a 5 facing in the "Four Star" era but it seems that he changed later for a more open tip as an Otto Link brochure from 1940 list his mouthpiece as a " Tone Master Hawkins Special (0,78"tip opening). 1,85 mm - 073 "
Among his famous students are Michael Brecker, Eddie Daniels, Bob Berg, Dave Tofani, Dave Liebman, Paul Winter, Victor Morosco, Eric Dolphy, Harvey Pittel, Col Loughnan and Kenneth Radnofsky. Joseph was the coach for the saxophone section in Glenn Miller's Orchestra as well as Benny Goodman's Orchestra. Joseph studied clarinet under Gaston Hamelin of the Boston Symphony and saxophone under Lyle Bowen. 2,35 mm - 0,92 "
The Otto Link Improved Tone Master F.P. model was made by Otto Link only for Flip Phillips himself. The mouthpiece pictured is the own Flip Phillips mouthpiece. 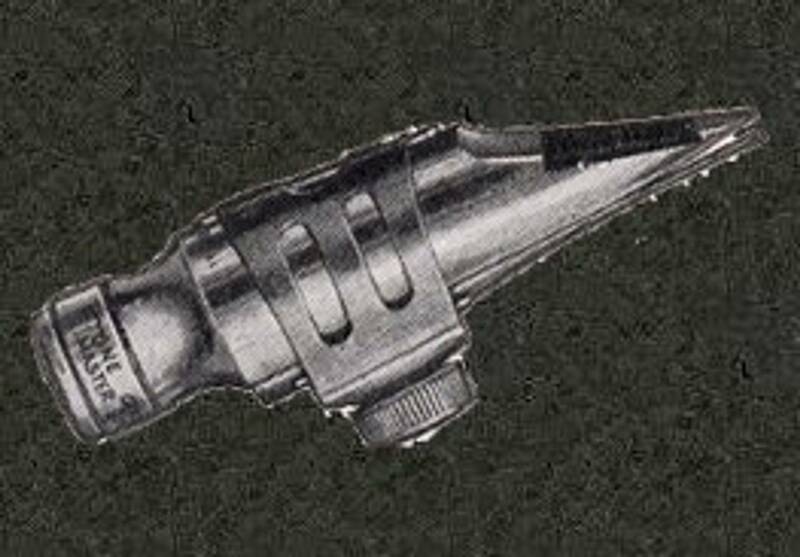 This mouthpiece was played by F.Phillips on legendary Mercury / Verve records with Charlie Parker and Machito orchestra in december 1950 on "Machito Afro Cuban Jazz" and "Norman Granz Jazz Session" in july 1952, with Charlie Parker, Benny Carter, Johnny, Hodges and Ben Webster and on many other recordings. It was nickel and gold plated by Otto Link in the 60's. (Thanks to Mr Frank Laidlaw and Mr Kenny Davern). 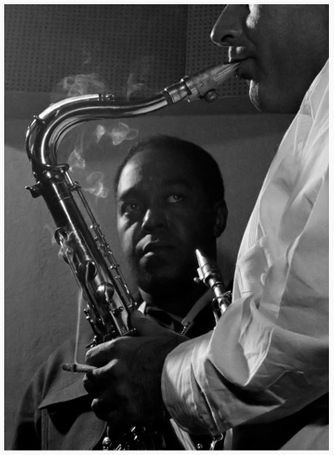 Below: F.Phillips with Charlie Parker. Auld was born in Toronto, but lived in the United States from the late 1920s onward, and was most noteworthy for his work withBunny Berigan, Artie Shaw, Benny Goodman, Erroll Garner, Dizzy Gillespie, Al Porcino, Billy Eckstine, Tiny Kahn, Frank Rosolino, and many others. Primarily a swing saxophonist, he did many big band stints in his career, and led several big bands, including Georgie Auld and His Orchestra and Georgie Auld and His Hollywood All Stars. He recorded the music for Alfred Hitchcock's movie picture "To catch a thief " in 1955. Auld also played some rock´n roll working for Alan Freed in 1959. He can be heard playing sax on the Ella Fitzgerald recording "Thirty by Ella". In 1977 he played a bandleader in New York, New York, starring Liza Minnelli and Robert De Niro and also acted as a technical consultant for the film.He died in Palm Springs, California, aged 71. G.Auld played the Otto Link mouthpiece with a Conn tenor sax, he switched later to a metal Berg Larsen mouthpiece and a King Super 20 tenor sax.